Plant Biology Conferences|Plant Conferences | Plant Science Conferences |Plant Biotechnology conferences| Plant science meetings |Tokyo,Japan. 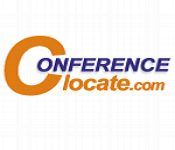 Conference Series Ltd conferences,“7th Asia Pacific Plant Biology and Plant Science Congress” during August 19-20, 2019 in Tokyo,Japan aims to bring together leading academic scientists, researchers, specialists and research scholars to exchange and share their experiences and research results on all aspects of Plant Biology and Plant Science. It also provides a premier interdisciplinary platform for researchers, practitioners and educators to present and discuss trends, the most recent innovations, and concerns in the field of Plant Biology and Plant Science. Plant Biology and plant science Conference focus current topics in Plant Biology, Plant tissue culture, Plant Biotechnology, Plant nutrition and Soil Science ,Plant cell biology, Plant Bio-informatics, Plant Genetics and Epi-genetics, Plant Morpholgy, Plant Nanotechnology, Plant Ecology, Plant breeding and Development, Plant pathology, Phenotyping and Photo synthetic diversity, Pest Management, Plant Biology applications, Medicinal and aromatic plant sciences, Horticulture, Assimilation of mineral nutrients will be able to discuss about the latest issues and trends in Novel technologies of plant biology and plant sciences. Plant products are important for Food, medicine, energy, and so many things we can get from plants. 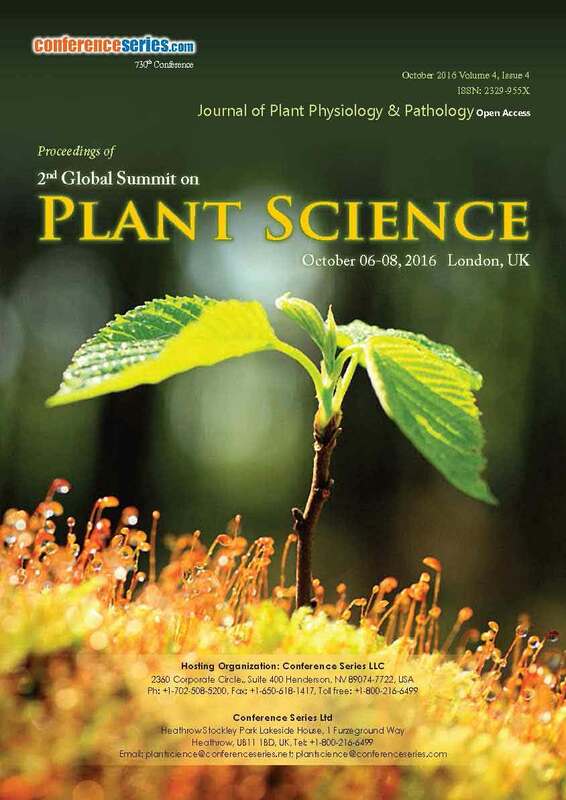 This conference brings all such scientists, researchers, scholars, Noble Laureate, students and people together those who are involved in Plant Biology, Forest Science, Soil Science, Agricultural Science, Plant Science gives a great opportunity to discuss about their innovations, exchanging ideas and interaction with each other. Conference Series Ltd conferences, “7th Asia Pacific Plant Biology and Plant Science Congress” during August 19-20, 2019 in Tokyo,Japan aims to bring together leading academic scientists, researchers, specialists and research scholars to exchange and share their experiences and research results on all aspects of Plant Biology and Plant Science. It also provides a premier interdisciplinary platform for researchers, practitioners and educators to present and discuss trends, the most recent innovations, and concerns in the field of Plant Biology and Plant Science. Plant biology divaricates with the study of plant development and plant life. It configures with wide range of topics as they may include plant growth and structure, metabolism, morphology and anatomy of the plant, physiological mechanisms. Secondary metabolism of plants may include the products that are not utilized largely by the organisms. Various environmental changes in the temperature, and the nutrients and the presence of sunlight will helps a plant to grow. Most of the plants are used in the preparation of medicines, herbalism, organic compounds and also they are used in the preparation of modern medicines such as reserpine, morphine, digitalis.Computational biology utilizes biological data to develop algorithms for understanding the biological systems. Plant tissue culture is a collection of different types of techniques of plant cells, tissues and organs under sterile conditions. Different types of techniques are used as they may include explants and interiors. Regeneration efficiency of plant tissue culture may varies between ecotypes and cultivares. Explants of plant tissue may include portion of stem, flower, root. It is a branch of science deals with the application of technology on life of plants. Plants can make use of food by the chlorophyll from carbon di oxide and water. Photo synthesis of plants will play a key role in plant science and technologies. Micropropagation of plants in biotechnology may include preparation of pathogen free –transplants. Plant nutrition is the study of chemical compounds that are utilized for growth of plant. Plant nutrition and soil sciences mainly focuses on the Nutrient management, Mineral fertilization, pedology, chromoplasts biogenesis,Soil microbial genomics, evolutional biology, Genetic analysis, abiotic stresses. Plant nutrition deals with the development of reap items, soil rich ness and to advance the reusing assets, supplements-related configured ecological effects. Plant cell are the basic unit of plant kingdom. It includes eukaryotes and prokaryotes. Parenchyma cells are the majority of cells in most of the plants. Specilized structure of a plant cells may consists of chloroplasts, large vacuoles and cell wall. Cell signalling pathways deals with the study of communication process that coordinates the activities of cells. 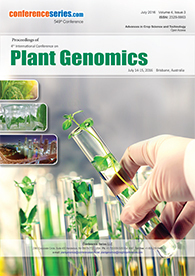 It deals with study of algorithms, data bases and methodologies for utilizing the plant proteomics. Comparitive sequence analysis will mainly helps to analyse the plant genome changes. Bioinformatics procedure are helpful for analysis of the genome sequence. 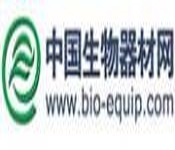 Plant biology data base will be obtained from the journals, literature researches. Plant genetics is the branch of science which deals with the study of genetic variation, hereditary and genes. Plant genetics appears to be similar to the genetics of animals in few areas. For sequencing of different types of plants they may consists of two types of methods such as Agrobacterium method and Gene gun method. 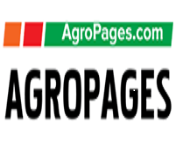 Agrobacterium method is applied mainly for dicot plants such as soyabeans, tomatoes, corn , rice. This method mainly involves single-site insertions of the foreign DNA .After extracting the tissue from the organism transferred to the antibiotic depending on the marker used. microprojectile bombardment often increases the efficiency of infection with Agrobacterium. Plant anatomy is the branch of science deals with the study of structure of structure of plant cells and tissues, morphology is the study of outer form. Difference between the plant cells and animal cells is plant cells may composed of cell wall, polysaccharides such as hemicellulose, cellulose, pectin. Plastids contain lipids, starch. Different types of vascular plants such as gymosphosres, ferns and angiosperms may have subterranean subsystems and aerial systems. Non-vascular plants such as horn plants, liverworts and mosses do not produce ground penetrating vascularizing roots as they may undergo photosynthesis. Plant nano technology involves complex processes in signal transduction mechanisms and in the regulation of DNA expression. Towards, it shows main role in antioxidant process for agriculture and and botanical sciences and their main aim at analysis of plant metabolomics. The increasing part of application of nanoparticles represented in smart delivery systems, promoting noble prize supports for components of magic bullets. Nanotechnology play an very important role in the agriculture, pesticides which will acts as a chemical delivery agents that targets the cellular organelles in plants. Plant ecology deals with functional relationship between plants and their habitant where they complete their lifecycles. It includes the study of biodiversity, genetic diversity, regional floras and interaction with the environment .Plant growth and development changes based on the proxy temperature, historical climate conditions, global warming. Reduced Ozone layer such as exposure to the higher levels of UV-B rays results in decreased growth rate. Understanding of the plant ecology is important for vegetation changes, habitat distribution changes and species extinction, taxonomy studies. Plant photoperiodism is the physiological reaction of plants to the relative lenths of light. It should be divided as the long-day plants and short day plants and day neutral plants. Long day plants mostly grow in the late spring or early summer. Short-day plants flower when the length of the night exceeds their photoperiod. New Genetic Engineering Techniques or breeding techniques will enhance the development of new trials in plant breeding. New breeding techniques involved in the changes in one or two genome DNA base sequencing. Different methods involved are Modifying and editing the genome during the repair process, transferring a gene from an identical species, adding a set of regulatory instructions from the same species and unaltered plant grafting onto a genetically modified stem plant, changing of base-pairs in a genome. Plant pathology is defined as the study of causative agents and environmental conditions that cause disease in plants. Different types of organisms that causes infection to the plants may include fungi ,bacteria, virus, protozoa. Control of plant disease is important for the production of food .Devasting plant disease such as chestnut blight and Irish potato famine, soyabean nematode and citrus canker. Disease control is achieved by the usage of crop-rotation methods, pathogen-free and control of field moisture and also with the usage of pesticides. Photosynthetic diversity is a process of conversion of light energy into chemical energy which should be act as a fuel for plants. This chemical energy will be stored in sugars, carbohydrate molecules as they are synthesized from the carbon dioxide and water. Oxygenic photo synthesis is used by the different types of organisms such as algae, plants and cyanobacteria. Carbon fixation is the process of conversion of carbon dioxide into sugars called carbon fixation. Phenotyping of plants may consists of biochemical or physiological properties, morphology and products behaviour. It may devided monomorphic and polymorphic .If two or more phenotypes exists in the same population they are called as polymorphic. Phenomics may have a wide range of applications in preparation of medicines and phenotypic crops are heat resistant. Pest management is the regulation of species which adversely shows impact on the human activities. Human response depends mainly on the range of tolerance through the deterrence, management to eradicate the pest. Pest control will be done based on the type of damage to the plant. Pests are divided as the cultural, biological and chemical forms. It should be achieved by applying the insecticides which are resistant to pests. Plant cell wall is used specifically in the form of paper, textiles, fibers (cotton, flax, hemp, and others), charcoal, lumber, and other wood products. And also other major use of plant cell walls is in the form of extracted polysaccharides that have been modified to make plastics, films, coatings, adhesives, gels, and thickeners in a huge variety of products. Medicinal aromatic plant sciences has been explained by the previous ancients. Other than aromatic plants, they have given importance to the medicinal values. Majority of the countries will predict traditional medicine is for secondary health care. Several countries over the world has documented this medicinal plants for primary research. Different types of compounds are involved in the research are herbal medicines, bioactive compounds, natural products, olive bioactive compounds, phyto chemistry. It is a branch of science deals with the study of vegetables and fruits. It may be devided as Pomology and olericulture. Olericultutre confines with the cultivation of vegitable plants. Pomology confines with the study of ornamental plants and flowers. Horticulture mainly focuses on the green house and floriculture management, cultivation of plants. Incorporation of various kinds of essential components into organic forms area unit necessary for plant growth and development. atomic number 7 is that the most vital assimilation. several bacterium unleash atomic number 7 by the protein technology. The capability of the foundation system to soak up nutrients improved by this association – the plant life hyphae area unit finer than root hairs. Passes through many organic or inorganic forms before it returns to molecular atomic number 7. Plants have developed ways in which to inducethese from the soil as quick as doable. 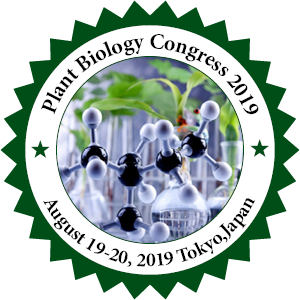 7th Asia Pacific Plant biology and plant science Congress is a two-day programme and invites all the participants for presentations, discussions in the research area of plant biology and plant science which is going to be held in Tokyo,Japan August 19-20, 2019.This conference brings all the Health care professionals, researchers, doctors with interactive talks, sessions, symposiums, workshops in the key area of plant science and plant biology. Research in the area of plant biology delivers a talk on different types of regions such as plant ecology, plant breeding technologies, genomics of plants, horticulture. August 19-20, 2019.Research on plants will enhance the latest ideologies and innovations in plant sciences. Research on plants delivers how to tackle the problems in health, agriculture and environmental sciences. This event provides a chance for keynote presentations, poster presentations, Oral talks, exhibitions and young research forum. Japan is located in the southern half of the East Asia. It is bordered by the North Korea. It was established in 1948 as a modern and became world most productive economies.Tokyo is Japan’s capital and largest city in agricultural sector which employes about 12 percentage and covers 6 percent of nation. Tokyo occupies one quarter of the Japans total population.Japan is one of the top export market plants such USD77.04million compared to other countries. 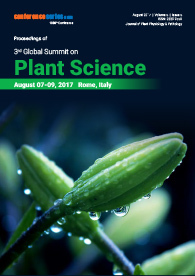 With members from around the world focused on learning about plant science, this is your single best opportunity to reach the largest assemblage of participants from the industries, Universities, community, etc., Conduct demonstrations, distribute information, meet with current and potential researchers and receive name recognition at this 3-day event. 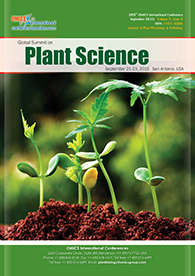 World-renowned speakers, the most recent techniques, tactics, and the newest updates in plant research field are hallmarks of this conference. The target audience will business entrepreneurs, and the manufacturing companies of agricultural products, be plant and plant microbiologists, plant biotechnologists, plant genomics students and scientist, agricultural associations, plant physiologists, plant genomics researchers and faculty. Different types of people all over the globe mainly focuses on the new technologies and innovations in the area of plant sciences. It is a great opportunity for learning different novel system of plant biology on a single platform.